All transactions are safe and secure with a reliable history in online purchasing behind each of our associates. 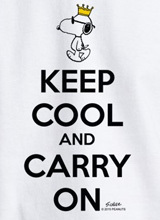 Buy the Joe Cool t-shirt to own Snoopy clothing and merchandise. While Snoopy books make it seem like our favorite beagle's adventures are always wild and exciting, that isn't always the case. He has some more tame times like when he transforms into Joe Cool by putting on some shades and hanging out. If you are hip enough to be cool doing nothing too, then get this Snoopy Joe Cool shirt. Pair this tee with a Snoopy watch for a complete look that even Joe Cool would envy. In addition to the Joe Cool tee above, browse the Snoopy Clothing Gallery for more apparel like men's and women's clothes, kids shirts or hoodies.